Natural live rose, which will delight you for 5 years. 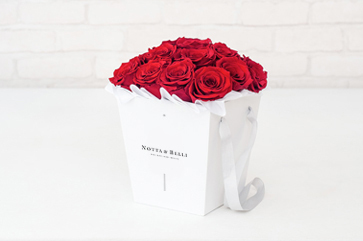 There is a Swedish proverb which reads: “If I had a rose for every time I thought of you, I’d be picking roses for a lifetime.” Here at Notta & Belle, we simply adore the sentiment behind this saying, as it goes to express everything that is special about the rose, the flower of everlasting love, nature’s blooming display of romance. This beautiful proverb also alludes to the reason why true romantics across the globe come to Notta & Belle to select a gift that says, “I love you, not just now, but forever”. Our rose in a glass case allows lovers worldwide to gift the ultimate symbol of undying love and sweeping romance - the queen of flowers, the rose - but in a unique, luxurious presentation that will live on and on, just like your affection for that special someone - whether that’s a boyfriend, girlfriend, husband, wife, beloved friend, adored colleague or cherished relative - on their birthday, your anniversary or engagement, Valentine’s Day, Mother’s Day, any other significant occasion, or just because you love them, so! The Notta & Belle rose encased in glass is a perfectly-preserved real rose, grown by us on our own plantation, and specially preserved using stabilisation technology unique to our company. We select only the most gorgeous roses - with no imperfections and perfectly in bloom - and tint them in a rainbow of elegant colours (from the darkest black and striking deep red to baby pink and Tiffany blue) to suit every taste, before encasing them in crystal clear glass. 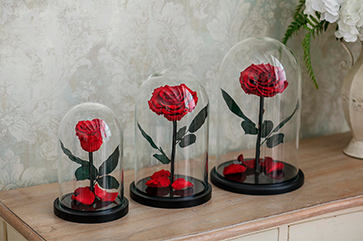 Your Notta & Belle rose encased in glass will live on for up to five years, as if it was just freshly picked from an abundantly blooming rose bush, and all without any special care on your part. It’s like magic! 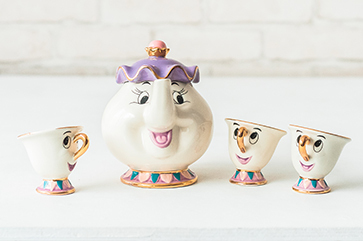 Like something from a real-life fairytale. We call it the ‘forever rose’. 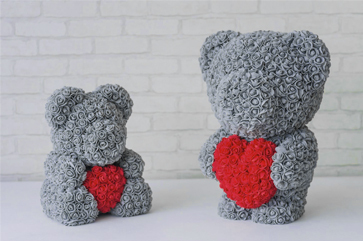 And it will forever be in the heart of the recipient, who will truly understand how much they mean to you upon receiving such a thoughtful, one-of-a-kind gift. The beauty of the forever rose in a glass case is that it perfectly captures the classic sentiment a spectacular bunch of roses would, but will not wilt or fade like a normal bouquet. Every girl adores roses. Waking up besides a vase of freshly cut flowers lifts the spirits, boosts the mood and reminds her that she is cherished, completely, by that special someone who gifted them to her. Rising to a Notta & Belle rose encased in glass will give her all those same tender feelings, but so much more spectacularly. Every day, for years, her heart will skip a beat!